Most people don’t expect wood to flavor their food beyond the barbecue, if at all, and gastronomists rarely discuss the significance that wood has on ultimate taste. But trees and wood have a far greater influence over our plate and palate than you might think. So what does wood taste of? And how has it been used in cooking, distilling, fermenting, and even perfume creation to produce a unique flavor and smell? To find out the answers to these questions, food communications expert Artur Cisar-Erlach embarked on a global journey to understand how trees infuse the world’s most delectable dishes with the flavor of their wood. His flavor hunt extended into a three-year exploration covering everything from pizza, whisky, cheese, tea, and perfume to quinine, wine, maple syrup, blue yogurt, and more. 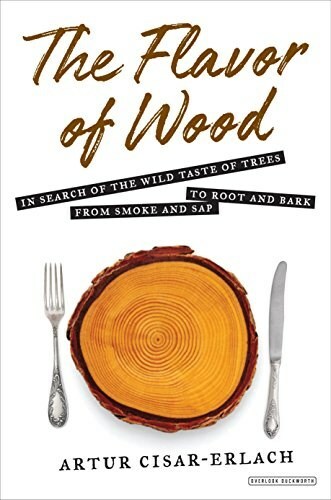 From wooden barrels used to age scotch in Austria to wood-burning pizza ovens of Naples to traditional Canadian maple syrup producers, The Flavor of Wood explores how wood infuses some of our best-loved foods through its smoke, sap, roots, and bark. As his quest spans continents and cultures, Cisar-Erlach introduces readers to a colorful cast of characters including Modenese balsamic vinegar producers, Piedmontese truffle hunters, South Tyrolean winemakers, and wild mountain pine chefs. Discovering that wood flavors beverages as well, the author encounters Austrian whisky distillers, Bavarian brewers, avant-garde central London tea merchants, and Indian tea exporters. A world trip brimming with fascinating encounters, unexpected turns, beautiful landscapes, scientific discoveries, and historic connections, The Flavor of Wood is the story of a passionate flavor hunter, and offers readers unparalleled access to some of the world’s highest quality cuisine and unknown tree flavors.